In 1909, William J. Purvis saw a child playing with a whirligig in a candy store. The railroad mechanic saw an idea for a flying machine. He gave the child a penny and left with the toy. On Thanksgiving Day 1909, a crowd gathered to watch a demonstration of Purvis and his partner Charles A. Wilson's "gyrocopter." Although weighted down with rocks to prevent flight, the machine lifted off the ground before settling back down. It had been hitched to a six-horsepower gasoline engine. Purvis announced that $10 shares in their company, Goodland Aviation, were available "at Lawyer Calvert's office." Investors put $30,000 into the company, a princely sum at a time when the average yearly wage was between $200 and $400. The partners built a workshop and hangar at what is now the intersection of Highway 24 and Cattletrail. Their engines were underpowered. Purvis traveled to St. Louis to buy a larger one, but he did not have enough funds to buy it. Investors had become skeptical and refused to invest anything more. Even if Purvis could have brought home the engine, Purvis and Wilson had not solved the problems of providing enough lift or controlling the torque. In March 1911, Goodland Aviation Company disbanded and sold its assets. Ironically, the United States Patent Office granted them Patent No. 1,028,781 in 1912. By then it was too late for the gyrocopter. Both men had already left Goodland, never to return and never to meet again. 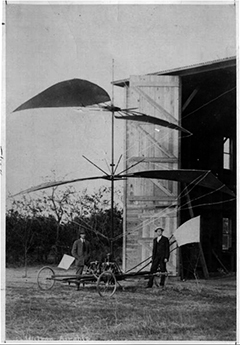 The High Plains Museum commissioned Harold Norton, a Brewster pilot and mechanic, to build a gyrocopter replica. Norton could see flaws in the design and had to force himself not to improve it. Wilson and Purvis' machine had too much weight and not enough power. The vibration would have destroyed the machine. But they were headed in the right direction before they ran out of money and out of dream. The replica sits on a stand in a well at the museum. Pushing a button on a counter above the well will start the motor and the blades will turn. Visitors cannot access the well without special permission. High Plains Museum was chosen No. 2 in the 2008 Eight Wonders of Sherman County contest. Open May-September, Monday, Wednesday-Saturday 9 a.m.-5 p.m.; June-August, Monday, Wednesday-Saturday 9 a.m.-5 p.m.; Sunday 1-5 p.m. Mountain Time. Admission is by donation. One of Goodland's Arts in the Park paintings, Ad Astra Per Aspera, is just north of the museum on Cherry Street in Steever Park.